Before you read any further, understand that I am not “anti-eclipse”.. Now that I have written that line, I don’t think it matters if I am.. It was probably going to happen anyways…. I realize when this blog is posted our recent solar eclipse will be a far distant memory – seemingly gone as quickly as the event itself.. Me, having not planned well and not desiring vision loss briefly walked outside, noticed how dim it was in the middle afternoon, honestly got a little freaked out, and went back inside to my air conditioning.. This is not to reduce the genuine interest people had in this event with some traveling across the nation to crowd into a 70-mile wide swath of land from Oregon to South Carolina – or watching the event streaming online for the entire day. People were really into this thing.. And, why not? Natural events like this only happen periodically on different areas of the planet and it is rare for an entire nation to share in the spectacle. But man, was it over fast.. I tried to imagine what it would feel like to be a person who traveled a really long way to view this thing a few minutes after it was over..To me, it would have to feel like a bit of a let down.. We drove all these miles for that? And that is what has gotten me thinking about the eclipse, what kinds of behaviors are drawn out with these kinds of events, and how quickly they are forgotten..Seriously, the fact this blog posts on Thursday when the event was Monday will feel like such old news.. If so, do you remember we had an eclipse on Monday? Of course you don’t. 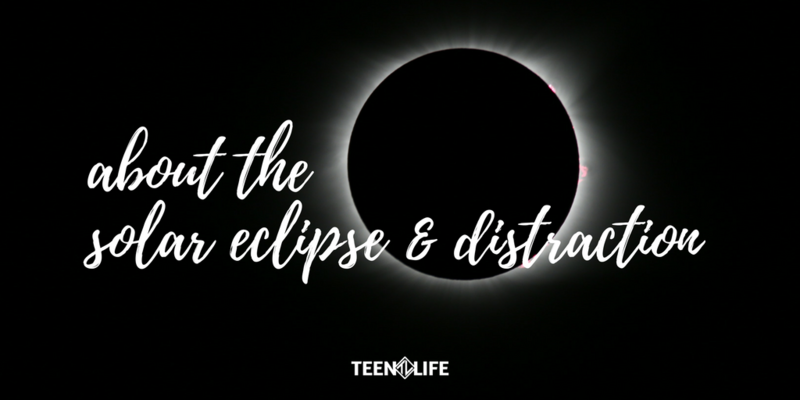 Events like the eclipse highlight a trend we see in culture.. Everything is the biggest deal ever, until it is not.. Think about it all of the happenings in a given news cycle, how big a deal we make of it, and how quickly we move on to the next thing.. Controversies happen, people demand recourse, feelings are hurt, it feels like the world is going to end, then we get distracted by something else and we forget about it. We crave distraction.. It’s an easy thing to come by, and in abundant supply.. And, it isn’t always bad.. Sometimes life is genuinely difficult and a good distraction can help us clear our minds and give our soul the needed rest to better face challenges.. This is healthy distraction. Our problem comes when distraction becomes habit.. Constant social media, news, alerts, emails, texts, controversies, politics, and so much more that listing them all would be distracting in and of itself – create ample room for distraction as habit.. It just becomes what we do. Distractions as habits will always lead us to a dead end.. Nothing new was learned.. We aren’t any better.. We just got better at being distracted. Now what? Now, let’s get to the business of real things – relationships, feeling and doing, risking, confronting, crafting and creating.. Let’s be about the things that – at the end of the day – make us and those around us better.. Let’s make habits out of enduring things, investments in a better life to come.. Pop culture and at-large opinion makers will always tempt us towards the shallow and easily consumed aspects of our world.. But the less traveled road will take us slowly away from these things into the wild of real life. What do you think? How have distractions become habits for you?